There’s a sink-hole in front of you. It is bigger than you… in fact, it’s bigger than the house you live in. You know that you need to fill this hole up as fast as you can. And, you also know that it’s still sinking. You may think it has stopped, but it hasn’t. It may have stopped widening, but it’s still sinking. To fill up this wide and gaping hole in front of you, you have a shovel. Now. But, for years you’ve had only your hands and feet. You tried to kick and throw in as much dirt as you could to try and fill this hole, but it was widening and sinking faster than you could throw a handful of rocks in. Now, though, since you’ve found that shovel, you can see that you’re making progress. There’s this bit at the bottom that appears to be filling. Finally. 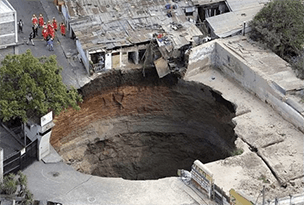 What is that sink-hole? Debt. Debt to the tune of: a mortgage, student loans, car loan, and unpaid credit card balances. What causes it to continue sinking? Interest on all of those loans. What caused it to widen? Your own spending…spending more on credit, or taking out another loan (car, school, etc.). Nearly everyone has one of these sink-holes. Jonathan and I do too. And here’s the good news: We’re paying it off. Two years ago, Jonathan and I canceled all our credit cards, choosing instead to live a cash-only lifestyle. This means that if we don’t have the cash to buy something, we have to wait until we do. Then we build businesses and income streams to afford whatever “this” is. That gave us a total of $284,000 that we owed to other people…PLUS interest. We were paying it, every month, but never felt like we were getting ahead. So, our first order of business was to cancel our credit cards. At least that way, we couldn’t spend anything more on them. Then, we signed up for a program that would work with creditors on our credit card balances. Next, we took every spare penny we had, and put it towards paying off debt: credit cards first. I’m proud to say, that after only 2 years, we have less than $6,000 left on our credit card balances. And we sold the car that had the car payment. That means that in 2 years, we’ve paid off over $47,000. Still, today, we are putting every spare penny we have towards paying down debt. When we started, about 25% of our income was going to debt repayment, and we weren’t getting ahead of it. The good news is that in 10 months or less, we will be completely free of consumer debt / credit card balances, which will leave us with student loans and our mortgage. Then, our sink-hole will start to fill up even faster, because for us, being debt-free (filling that sink-hole) is the most important way to spend our money right now. So how can we afford to travel? Hard work. Really. Most people think we’re on vacation just because we’re traveling. But the answer to how we afford to travel is that we work really hard. Just to reiterate: we’re still working while we’re on our world travel. That’s why being settled somewhere for a longer amount of time (here in New Zealand) has been so important to us. It allows us more time to work, and get set up to work a bit less for three months… then we’ll settle somewhere again and work really hard. That amount is actually less now that we’re living in New Zealand and things here are more expensive than in Central / South America. As much of that $1,830/month as possibly can is going to paying back our debts. Jonathan’s note: Looking at a mountain of debt is really hard. What’s even harder is to gauge the size of a mountain when you have no idea how big it is. If you are in debt on credit cards, a good place to start is by writing down everything you owe, and to whom. I am also of the opinion that everyone should spend at least 1 month tracking everything they spend, and everything they earn. Most people want to improve their money situation, but aren’t willing to do something as simple as tracking spending and earning. For whatever reason, it’s actually quite difficult to be disciplined enough to track it in-between 10-25 days. After 30 days, it becomes easier. But people freak out about money, without really knowing what their money picture is. If you want to know who we went through to help get our interest rates down, or want to know more about this process (a 4-year process for us so far), please post a comment below. Wow…. kudos to you two. And how honest and open you are about sharing the story. As they say, “I know your pain”… but mine is much smaller. Hey, I am now also looking at both Malaysia and Phillipines on your current side of the globe. Do you have an opinion therein? Didn’t realize I hadn’t responded to this. If you’re looking for help learning Internet marketing, please visit http://www.ThreeMoneyMethods.com. I share some of what I know through that site. Malaysia and the Phillippines are both places we want to go… Malaysia is one of our stops after we leave New Zealand. Hope you’re doing great! What have you decided on Malaysia/Phillippines? 1. If you always do what you’ve always done, you’ll only get what you’ve always gotten. 2. It takes courage to improve your prospects for a brighter future. I’ll admit I don’t read all of your blog posts, but I’m really glad I read this one, and I’m very happy for you two! This is an inspirational story that proves living within your means doesn’t have to be boring. Good story, thanks for sharing it. A good book that I read is “Smart Women Finish Rich” by David Bach. But, just because of the way I grew up and the income that I had, besides farming loans on machinery and land, I made it a point never to charge more than I could pay off in three or four months, mainly at Christmas time. I guess I also borrowed some so my kids could go to college, but that too was small. Not as much as what you show. Just think of the cash you will have when the loans are paid off! This totally is the American dream, updated for the 21st century. Well written, well explained, & well implemented. Well done all around you two! I do think the American Dream has always been to own your own business and to have the support of the free enterprise system to get to where you want in life. And living in America has definitely allowed that to take place for us, even if we did finance massive amounts of debt at really high interest rates. Just my opinion, but I think businesses are the way to get the American economy moving successfully again. I know that we’ve created some good part-time work for quite a few people through our business ventures, as we’ve needed good people to help us accomplish our goals. What is the info. about credit card reduction? I don’t use one now, but have balances to pay off. Thanks for the example you are setting. Thank-you for reading and commenting. We used a company called TakeChargeAmerica. They’ve been good to work with… We’ve still had to do a fair amount of leg work, but what they did in getting our interest rates down has reduced the amount of time it will take to pay back our debt by at least a year, but likely has reduced the time by closer to 2 years. I haven’t done the numbers, but we’ve saved a lot in interest (maybe thousands), with their help. Hi Jonathan and Carrie! Thanks for sharing this one. It got bumped to my junkmail somehow so I am just getting to it now. Zach and I are also prioritizing debt repayment. Of course, that’s nearly impossible right now what with me only working part time and waiting on ID bar results. But moving out of Colorado reduced our cost of living by about a factor of 30. It’s ridiculous the amount of money we can live on out here. Our debt consists of my student loans ($180K for law school, don’t even talk to me about your $40k 😉 lol), and our individual credit card balances that we brought in. I’d paid of $30K of the student loan over three years, but the credit card balances NEVER go down. I’ve called and asked for interest rate reductions and they won’t even talk to us. In total we pay about $850 in just credit card payments each month. I worry about using a service to reduce interest rates because of the impact it could have on credit scores and the like. Did you have any cons to using TakeChargeAmerica?? Email me if you want. I’d looooove to know more. It’s a constant stressor in our lives and there have been many many tearful nights worried about getting by on Zach’s small salary out here. How are you doing on getting this figured out? You’re taking steps, which is definitely a good path. Seems to take forever though, huh? How’s the job situation looking? Well, to be honest, there really aren’t that many jobs here in Idaho. At least not full time jobs, and I swear that the ones there are go to in-state-graduates or people who knew someone 10 years ago, etc. It’s been hard to break into it. I feel lucky to have the three PT jobs that I do. That being said, we are now starting to look in Colorado, too. Zach’s had some luck with finding open positions, but it’s still super-competitive for me there, too. That’s down the road a bit, at this point. If I could find FT work here in Idaho, it might be different, but it’s not looking likely at this point. Hey there – thanks for the story – makes me feel better that I am not the only one. I have been travelling for the last 1.5 years and have been in the process of just making do with payments to my debt back in Canada. Today it ends. Today I plan to make a change to actually facing that debt and making it a priority to doing something about it – not “just getting by.” Your write-up has inspired me, so thank you. Thank-you for making time to comment! It makes me feel better knowing we’re not the only ones too! Facing the debt monster is not easy or fun. But it’s really exciting to think that we’re really gaining on it now. I saw your writing on your site and also your passion for the outdoors. Would love to chat with you about ways we might be able to have you do some writing for our site http://www.GreenJoyment.com. Please let me know if you’d have an interest there? It would be nice to be debt free. Just take it one piece at a time. First thing’s first. What does your financial picture look like right now? What do you owe, and to whom? My wife and I are still working hard, but not for too much longer. We’re 30 years old and plan to travel Australia sometime soon, we don’t have a time-frame yet. We’ve already bought a nice Landcruiser, and I spend time renewing all the mechanics, which I enjoy. We have been working hard to create a property portfolio and will not have to work while we travel once our profits are sufficient, we would like to comfortably have $100,000 between us per annum to be comfortable and will most likely return to work once we get back from our trip to continue building our retirement fund. The 4 hour workweek and Mr Kiyosakis books are good, I like the idea of ‘mini retirements’ and thats exactly what we plan on doing, can’t wait, and once again, good on you two! Good on you for looking into alternatives and actually working on them. Are your properties in OZ as well?